This is a companion piece to my "Happy 90th Birthday, Horst!" post. 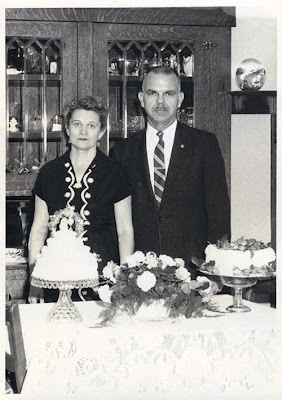 That post was originally featured on a website I had in 2000, based on a birthday party I attended for a 90-year-old man I knew named Fritz, but changed to Horst for the website. The pictures featured a man who was neither Fritz nor Horst, simply because I couldn't use pictures of Fritz himself, and I owned copies of these pictures from buying them at an antique store, or somewhere -- I don't actually remember where. 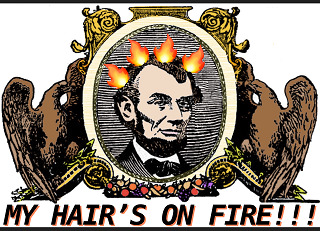 An antique store is most likely. They had a guy at a younger age and then older, as I needed. The names of the folks is given on the back of one of the pictures. I decided now, in 2013, to look them up online, and they were there! 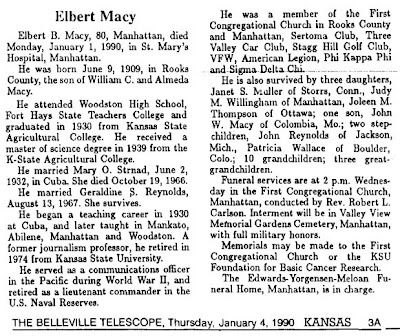 They were Elbert and Olive Macy. Olive's actual first name was Mary, so Mary Olive Macy. 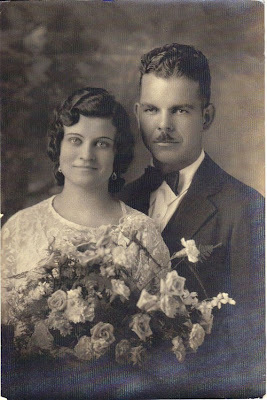 I have two pictures of them, the first one below from their wedding in June 1932, and the second from their 25th wedding anniversary, June 2, 1957. 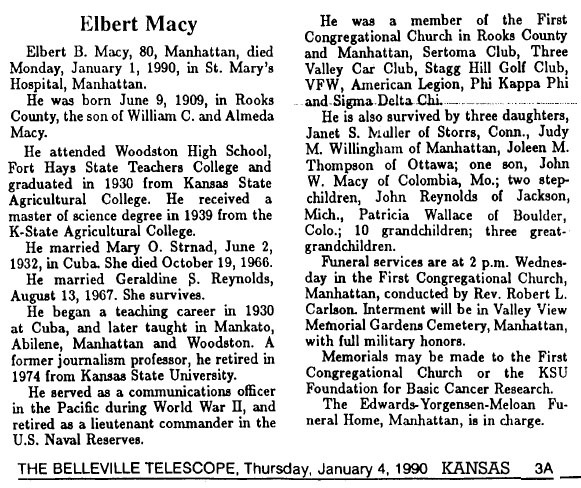 Below the pictures are a couple of newspaper accounts, first, an account of their wedding, and, second, Mr. Macy's obituary from 1990. They had children and grandchildren. If any of them happen to read this, hello and my sincere regards. 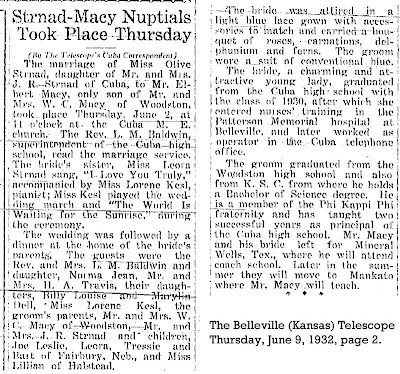 Elbert Bonebrake Macy, Manhattan, Kansas; Mary Olive Strnad Macy. Rooks County, Kansas. Belleville, Kansas. 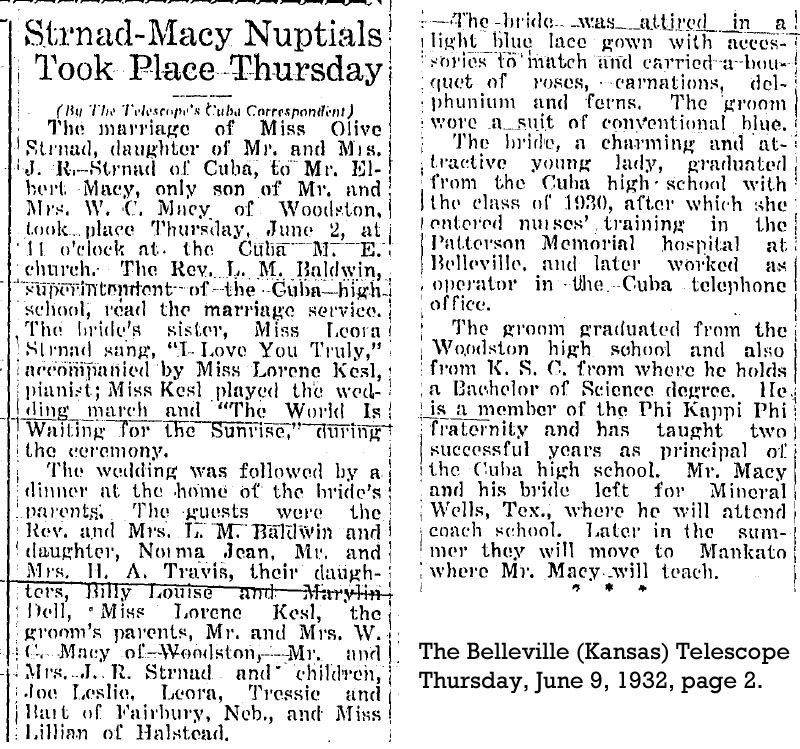 The photos and news article feature my grandparents. 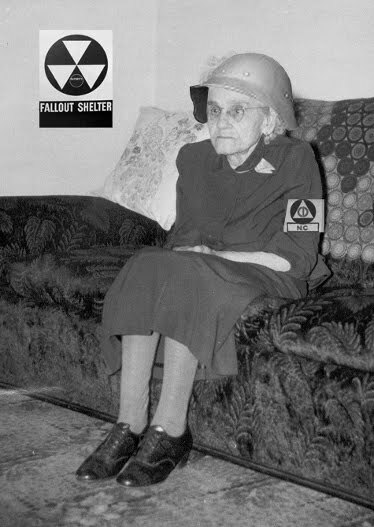 Grandmother Olive past when my mother was only 16. Dear Mo, I guess I put enough details it was only a matter of time that I'd hear from someone. That's great! Do you have pictures of your grandparents, besides these JPGs? Did you actually know your grandfather, since he lived quite a bit longer? If you or your family want these photos, I would send them to you free. I'm so happy to hear from you. My email is dbkundalini *at* gmail. Regards.